This article describes ways to generate and use secure shell (SSH) keys on a Windows computer to create and connect to a Linux virtual machine (VM) in Azure. To use SSH keys from a Linux or macOS client, see the quick or detailed guidance. SSH is an encrypted connection protocol that allows secure sign-ins over unsecured connections. SSH is the default connection protocol for Linux VMs hosted in Azure. Although SSH itself provides an encrypted connection, using passwords with SSH connections still leaves the VM vulnerable to brute-force attacks or guessing of passwords. A more secure and preferred method of connecting to a VM using SSH is by using a public-private key pair, also known as SSH keys. The public key is placed on your Linux VM, or any other service that you wish to use with public-key cryptography. The private key remains on your local system. Protect this private key. Do not share it. When you use an SSH client to connect to your Linux VM (which has the public key), the remote VM tests the client to make sure it possesses the private key. If the client has the private key, it's granted access to the VM. Depending on your organization's security policies, you can reuse a single public-private key pair to access multiple Azure VMs and services. You do not need a separate pair of keys for each VM or service you wish to access. Your public key can be shared with anyone, but only you (or your local security infrastructure) should possess your private key. Azure currently supports SSH protocol 2 (SSH-2) RSA public-private key pairs with a minimum length of 2048 bits. Other key formats such as ED25519 and ECDSA are not supported. You connect to and manage Linux VMs in Azure using an SSH client. Computers running Linux or macOS usually have a suite of SSH commands to generate and manage SSH keys and to make SSH connections. Windows computers do not always have comparable SSH commands installed. Recent versions of Windows 10 provide OpenSSH client commands to create and manage SSH keys and make SSH connections from a command prompt. Recent Windows 10 versions also include the Windows Subsystem for Linux to run and access utilities such as an SSH client natively within a Bash shell. You can also use the SSH utilities available in Bash in the Azure Cloud Shell. Access Cloud Shell in your web browser at https://shell.azure.com or in the Azure portal. Access Cloud Shell as a terminal from within Visual Studio Code by installing the Azure Account extension. The following sections describe two options to create an SSH key pair on Windows. You can use a shell command (ssh-keygen) or a GUI tool (PuTTYgen). If you run a command shell on Windows that supports SSH client tools (or you use Azure Cloud Shell), create an SSH key pair using the ssh-keygen command. Type the following command, and answer the prompts. If an SSH key pair exists in the chosen location, those files are overwritten. For more background and information, see the quick or detailed steps to create SSH keys using ssh-keygen. If you prefer to use a GUI-based tool to create SSH keys, you can use the PuTTYgen key generator, included with the PuTTY download package. Click Generate. By default PuTTYgen generates a 2048-bit SSH-2 RSA key. Move the mouse around in the blank area to provide randomness for the key. After the public key is generated, optionally enter and confirm a passphrase. You will be prompted for the passphrase when you authenticate to the VM with your private SSH key. Without a passphrase, if someone obtains your private key, they can sign in to any VM or service that uses that key. We recommend you create a passphrase. However, if you forget the passphrase, there is no way to recover it. Optionally, to save the private key in PuTTy private key format (.ppk file), select Save private key. You will need the .ppk file later to use PuTTY to make an SSH connection to the VM. If you want to save the private key in the OpenSSH format, the private key format used by many SSH clients, select Conversions > Export OpenSSH key. 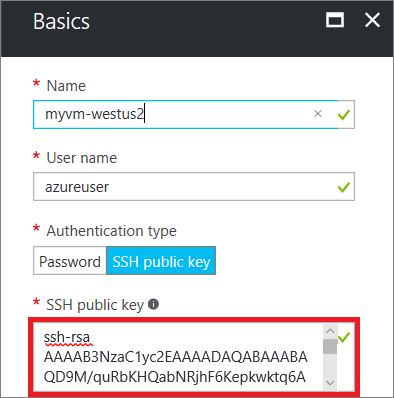 To create a Linux VM that uses SSH keys for authentication, provide your SSH public key when creating the VM using the Azure portal or other methods. The following example shows how you would copy and paste this public key into the Azure portal when you create a Linux VM. The public key is typically then stored in the ~/.ssh/authorized_key directory on your new VM. One way to make an SSH connection to your Linux VM from Windows is to use an SSH client. This is the preferred method if you have an SSH client installed on your Windows system, or if you use the SSH tools in Bash in Azure Cloud Shell. If you prefer a GUI-based tool, you can connect with PuTTY. If you configured a passphrase when you created your key pair, enter the passphrase when prompted during the sign-in process. If the VM is using the just-in-time access policy, you need to request access before you can connect to the VM. For more information about the just-in-time policy, see Manage virtual machine access using the just in time policy. 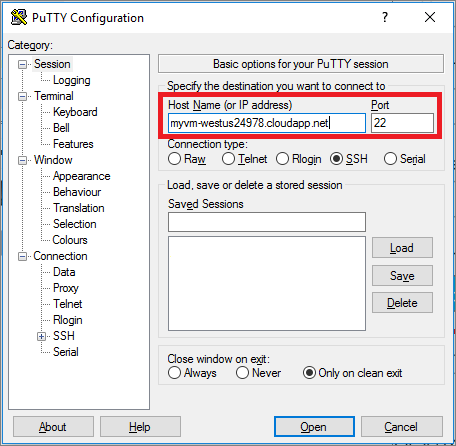 If you installed the PuTTY download package and previously generated a PuTTY private key (.ppk) file, you can connect to a Linux VM with PuTTY. Click Open to connect to your VM. For detailed steps, options, and advanced examples of working with SSH keys, see Detailed steps to create SSH key pairs. You can also use PowerShell in Azure Cloud Shell to generate SSH keys and make SSH connections to Linux VMs. See the PowerShell quickstart. If you have difficulty using SSH to connect to your Linux VMs, see Troubleshoot SSH connections to an Azure Linux VM.